A few days ago I started developing an obsession for t-shirts with brand prints and logos. 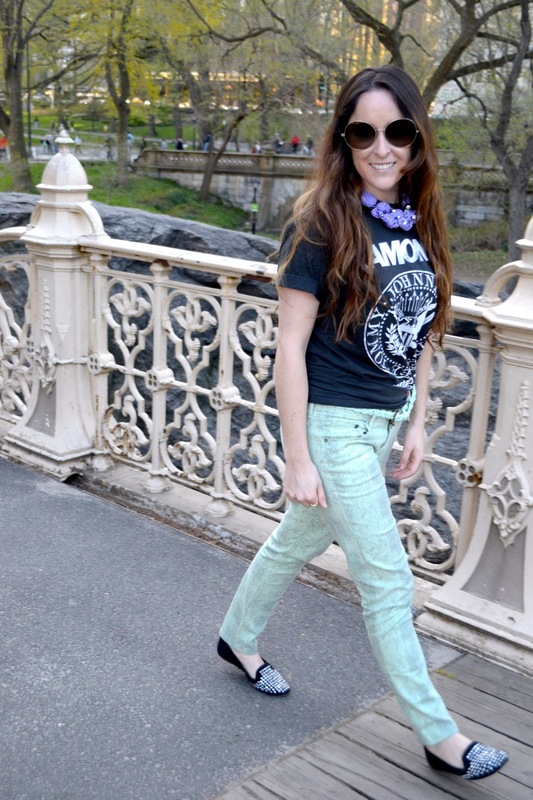 I found a “Ramones” t-shirt at Dueñas closet and did not hesitate to wear it (with its proper adjustments). To complement the outfit, I decided to wear a statement necklace which gave a cool twist. This accessory is from Marie SS13, which is PAAR’s newest collection. I also contrasted the look with mint colored pants. What do you think guys? Do you like it? Desde hace unos días tengo obsesión por todas las t-shirts con prints de marcas y logotipos. Esta me la encontré el domingo pasado en el closet de Dueñas y no dudé ni tantito en apropiármela para el fin de semana (haciéndole sus ajustes necesarios). Para complementar el outfit, estoy usando un statement necklace el cual le da un toque increíble al look. Este es de la colección Marie SS13 de PAAR el cual contrasta padre con el color de los pantalones. ¿Ustedes que opinan?